Chip Peddler are currently using these style bags on their website, so we will include this type for review (partly because we were served these Chips in a restaurant and don't know what bag they came in). It should be kept short and brief. We have nothing positive to say except their logo is a great graphic. These were served, so there were no broken Chips to compare. On the whole they were large and intact. They were also thicker than regular Chips. The Snap Test worked fine; two halves emerging from one with a brittle crack. A mouthful and a firm, thicker than usual crunch was experienced. 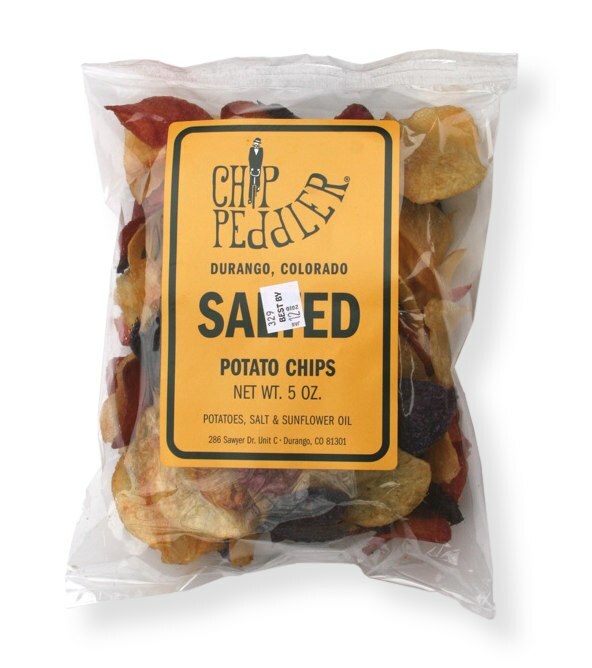 Chip Peddler described these odd looking Chips on their blog when they were first introduced, "I will be chipping up some new varieties of potatoes for the holidays which have been developed by the CSU Research Center in the San Luis Valley. You will see the Mountain Rose and Purple Majesty chips mixed in with the Atlantic potato chips currently in the Salted flavor on the shelves of DNF, Huck Finn Exxon, PJ's Gourmet Market & Nature's Oasis." The Chips were fairly thick and looked fantastically funky. When you get review something new and different it is a joy. There are a number of food dyed Potato Chips available, but these were not. Among other, the purple colored potatoes used and Dr David Holm of Colorado State University, who was involved with the research into the Purple Majesty Potato wrote this, "The Purple Majesty has very high antioxidant levels. These antioxidants have been shown to reduce blood pressure as well as have anti-cancer properties.” The taste was no different to ordinary Potato Chips, nothing special, but we were sold by then!